So it's over 6 months since my diagnosis, I'm done with treatment, and now I'm moving into a new phase: survivorship. Not sure how I feel about that word yet. Yesterday, I saw my oncologist's nurse practitioner (oncologist is on maternity leave), my surgeon, and today I see my radiation oncologist, all for follow-up appointments. Everything is fine, I feel fine, I'm healing well, etc. etc. 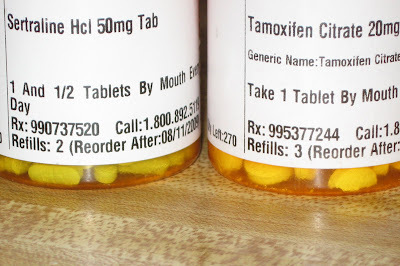 The only glitch in all this is that the anti-depressant I take has been shown to interfere with the cancer-preventing action of the Tamoxifen, so there is a good chance I will have to change to a new anti-depressant. This is somewhat depressing (couldn't resist) since it's the only one I've ever used that actually worked. On the other hand, having a recurrence of cancer would be even more depressing. Not to mention possibly fatal. So I'm willing to try out the new class of non-interfering depressants and see how it goes. Stay tuned for more on that. Overall, I'm feeling pretty good, although this is the sticky wicket: whatever was going on in my body that caused the cancer in the first place is likely still there. I'm hoping that a) the radiation b) the Tamoxifen and c) the ovarian suppression (if we can ever get it to WORK) will all help prevent recurrences. But there are no guarantees. I keep hearing about people who were treated, seemed fine, and then... either had a recurrence, or far worse, the cancer metastasized to other organs. You don't ever really get rid of cancer. It kind of lurks inside you. So I don't feel cancer-free or cured at all. I just feel....kind of nervous. A pretty constant, low-level nervousness. Occasionally, I forget. And then I remember. I still want to do some real work in the area of prevention, and haven't figured out how to do that. I still think cures are great, and early detection is great, but prevention is even BETTER. 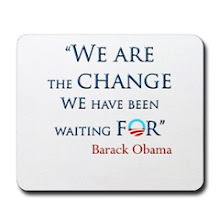 I still think that 50 years from now, people will look back on 2009 and laugh... That they will know that our toxic environment is causing all kinds of issues (cancer being only one of them) and they will chortle in disbelief at how stupid we were, not to understand. I almost forgot: almost in passing, yesterday, I mentioned to my surgeon that I'd received quite a bit of radiation as a child due to being a carrier of TB (annual chest x-rays) and due to having scoliosis (more x-rays of my spine to check on that). She said: "Yeah, that was a lot of radiation. That could be it." Interesting. I SO totally agree with you about the fact that prevention is the key and that in 10 years or so we'll be looking back on this thinking how in the dark we were. I also found it interesting that you had scoliosis. I've mentioned here before that my mom is battling breast cancer right now and she too had scoliosis as a child. I'm glad you're going to do that test. Shouldn't everyone? 10% is a high number. I have a friend in her 80s, who had breast cancer in her 50s. She is one of the most active people I know.